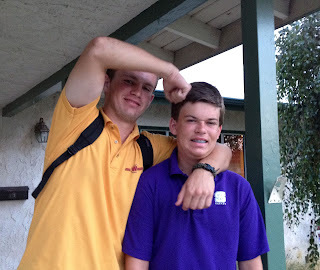 6:35am - About to leave to take the 11th grade carpool to school. Had to bribe the 9th grader to wake up for the photo. Excuse the blurry iPhone photos - it was 6:35am. And of course older brother has to have a bit of fun with his younger brother. Happy for my older son to get back to school - he will have a very tough year with his class load but he's very excited and more than ready to learn. It is now 7:25am and both are off to school. Weird....but now it's time to sing! Check out this circa 1996 Staples Commercial - cracks me up every time. My sons started yesterday - senior and freshman! 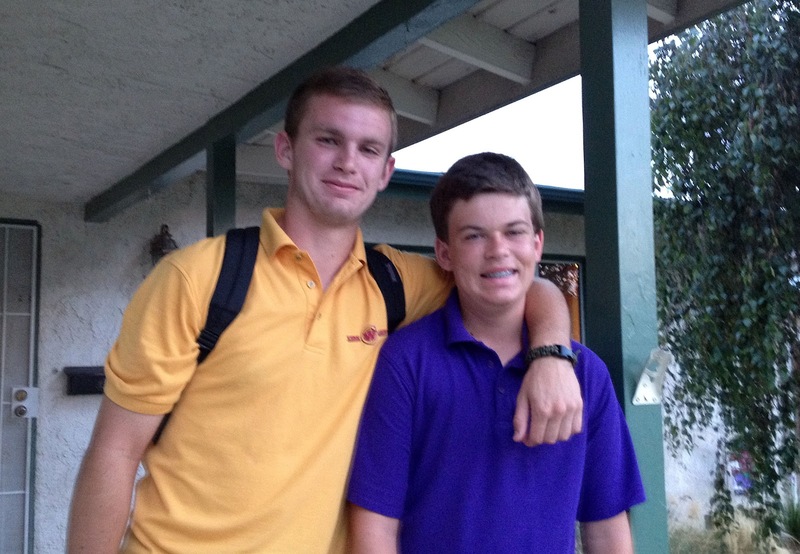 The senior drives both of them, which is more convenient this year now that they're at the same school. 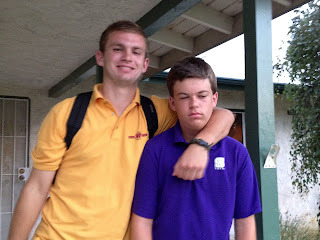 Our freshman would have the same comatose face if I had tried to take his picture! Here's to a great school year! I wish it were that light at my house at 6:35! Wyatt gets on the bus at 6:45 and it's still dark. Your boys are very handsome and I'm sure the older one will do great! Seems like I remember taking my hardest classes as a Junior, too. ROFL! I sing that now when the school supplies start showing up in stores! Too funny! My boys are still out :(. 2 1/2 more weeks for me! I've been singing that song all week! Oddly enough, the kids don't see the humor. Walking my daughter to school this morning was like dragging a puppy on a leash who's afraid to go outside. Meanwhile, I was skipping and whistling. LOL. I had forgot about that commericial. It's a good one. My daughter, in Florida, her oldest daughter started 11th grade this year and her 2nd daughter started 9th grade. Oldest daughter drives both. Nice. However, they have a bus for those days they may not be getting on. Not that that ever happens. So, that only leaves her to take 2 to elementary school, Kindergarten and 4th. haha....love that younger son got up for the pic - what was his reward?! Fun pictures. PERFECT song! LOL!